INDIANAPOLIS—Cowering in the dark at the top of the locker room steps, a tearful Andrew Luck reportedly hugged his knees to his chest Wednesday while listening to Colts head coach Chuck Pagano and general manager Ryan Grigson fighting downstairs. “They’ve been yelling for a while, and I’m pretty sure I heard them say ‘Andrew,’” said the visibly distraught quarterback, shuddering as the sound of raised voices echoed loudly in the stairwell. “Mr. Grigson was shouting that he signed enough talent and coach doesn’t know what to do with it. 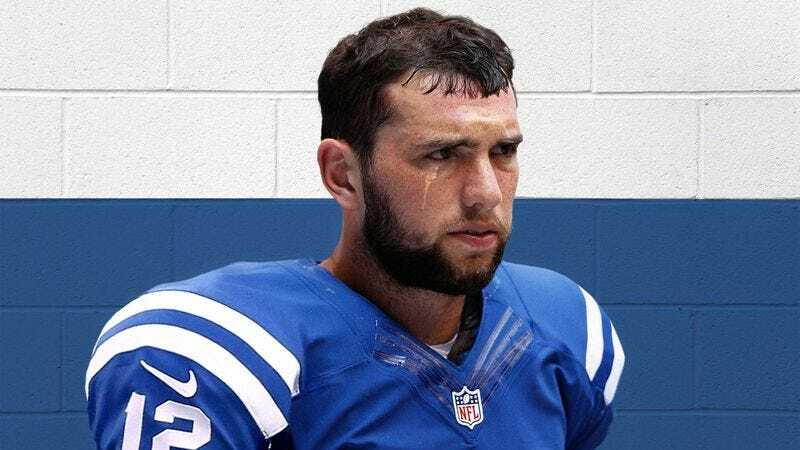 Then coach screamed ‘I can’t stand this anymore’ and ‘I hate you.’ Why can’t they just stop fighting all the time?” Luck then reportedly began trembling after hearing a loud crash followed by a disconcerting silence.